Why am I getting an error message: 'Fuel Tax Credit account has a Private Use %. A fuel tax credit account can't have a Private Use.'? Fuel Tax Credits (FTC) provide businesses with a credit for the fuel tax (excise or customs duty) that's included in the price of fuel used in: machinery, plant, equipment, heavy vehicles and light vehicles travelling off public roads or on private roads. You claim fuel tax credit on your business activity statement (BAS). Not all the fuel you purchase may be used in your business activities, so a portion of it should be allocated as a private used expense. Your accountant will recommend the correct Business Percentage for each Fuel Tax Credit Account. 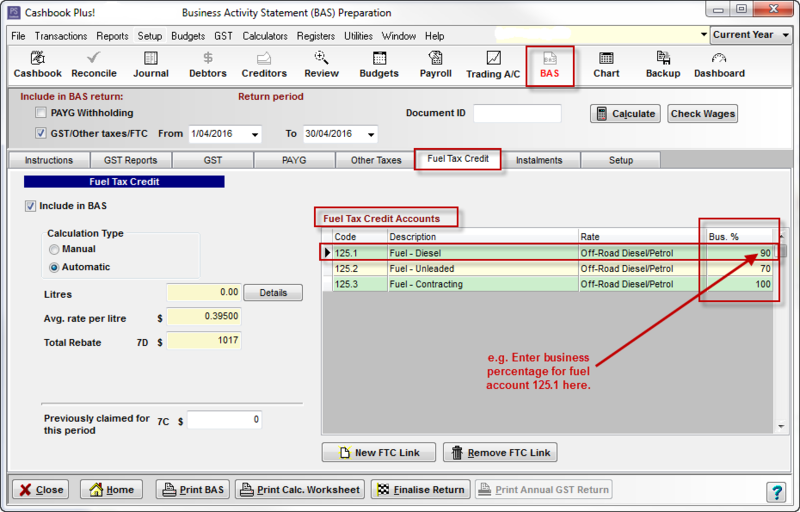 occurs because you have previously allocated a GST Private Use percentage, as part of your fuel acount setup in the Chart of Account, before you setup your Fuel Tax Credit Accounts in the BAS section of Cashbook. 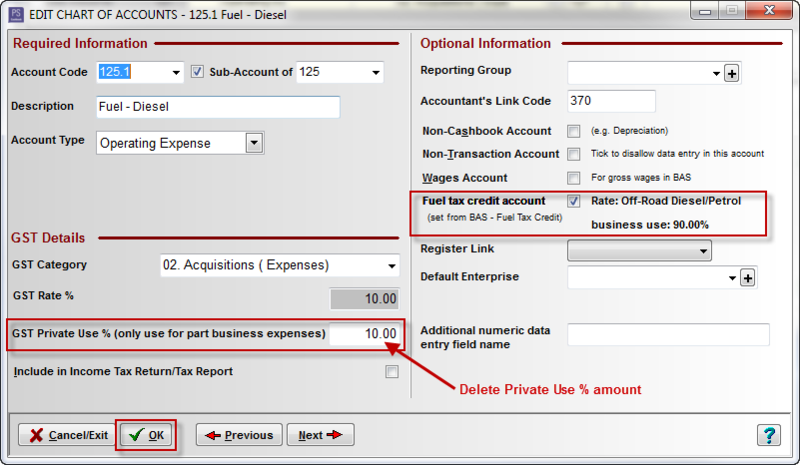 Business Percentage (Private Use %) allocation must be done in the BAS > Fuel Tax Credit section of Cashbook. Click on the All Accounts tab. In the Search For Code box, type in the account code in question, e.g. 125.1. Delete the GST Private Use % (only use for part business expenses) amount.